Undoubtedly Orford and its environs are a huge draw, this coastal area being tranquil, beautiful and ideal for cultural exploration. There is also wonderful walking through the nearby forests and heaths, or along the river banks. But the main reason so many of our guests return again and again is that they know they will be well looked after. The majority of our staff have been at the Crown and Castle for a long time. Whether it’s a housekeeper, waiter or receptionist, most of them recognise our regular guests and understand their individual needs.This doesn’t mean we don’t love welcoming new guests, of course, but the aim is always to turn them into regulars! Keeping our food offer seasonal, sensible and lively also helps, as do comfortable bedrooms where we hope we’ve thought of every detail. Orford’s magnificent castle (strictly speaking just a keep) is just yards from the C&C. Built by Henry II in the 12th-centtury, it has far-reaching views from the battlements with historians believing it was built more for prestige than defence. Orfordness, the 12-mile long shingle spit that separates the rivers Alde and Ore from the North Sea, is riveting. Until only 20 years ago, the Ministry of Defence used this desolate place to test nuclear weapons, and the sinister remnants of their work remains scattered across the landscape. On the plus side, the huge security blanket that existed for decades has ensured a natural paradise for a wide variety of sea-faring birds, particularly the rare avocet. Visitors cross by ferry from Orford quay, but access is restricted: the Ness is closed from November to Easter, with Saturdays only in the shoulder months and five days a week from July to September. Snape Maltings (home of the Aldeburgh Festival) is also nearby, as is the charming market town of Woodbridge, with its restored tide mill. 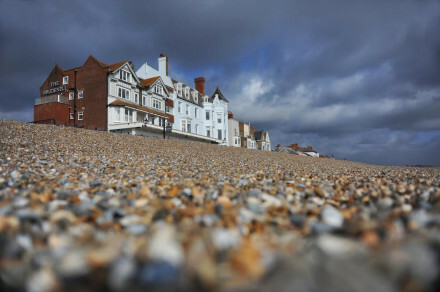 The smart seaside town of Aldeburgh is about 30 minutes’ drive away. To the west of the village lie Tunstall and Rendlesham forests. It’s impossible to exhaust the wonderful walks these magnificent, ancient woods provide but if the beauty of 500-year old oak trees does start to pall there are always the coastal and river paths to explore. Excavations at Sutton Hoo in 1939 uncovered the ship-burial of an Anglo-Saxon warrior king, including the iconic Sutton Hoo helmet, weapons and priceless royal treasures. Intriguing insights into Britain’s history are offered by the Sutton Hoo exhibition, including a full-size reconstruction of the burial chamber. Breakfast is a proper meal, served at the table and cooked to order. It caters for hearty appetites (guests tell us they often miss out on lunch after having our breakfast!) as well as those who prefer a lighter, more fruit and yoghurt-type start to the day. Do you offer other meals? Can you recommend good places to eat out locally? We serve lunch and dinner both to resident guests and outsiders. The lunch menu is a more casual, but still properly prepared and cooked meal, and can be served outside except on Sundays. Dinner is an authentic combination of traditional British food and Italian dishes. It is really impossible to say: those with dogs love the Garden rooms with their semi-private terraces, as do many other guests in the summer months. The Best House and Terrace rooms are always popular as are entry level, Good House, rooms. All have their merits and different people like different things about them. The minimum age for children staying with us is 8 years old. The 2-course a la carte dinner, bed and full English breakfast rate is £75 per child per night. For many years now, this high-end restaurant-with-rooms has stuck to a proven formula of good food, friendly service and comfortable rooms which, along with its excellent coastal location, ensures a loyal and enthusiastic following of repeat guests.